Issue number THREE is out in the World! Three's not a crowd, it's a family! My daughter came home from school a few months ago singing Humble and Kind. It’s a beautiful song written by folk singer-songwriter Lori McKenna, and made famous by Tim McGraw. What a brilliant motto by which to approach my role here at Blank Spaces. The progress we’ve made, the friendships we’ve forged, the established writers we’ve celebrated, and the initiates we’ve championed—wow! I have so much to be proud of. 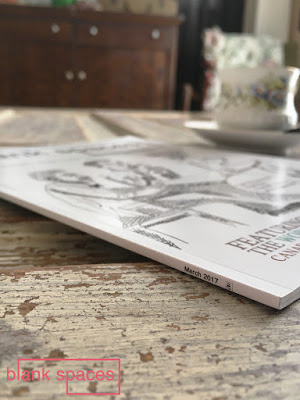 But so do you—every one of you beautiful people who have contributed, purchased, and shared this little vision of mine. None of this could happen without you. You are the heartbeat of this project, and I thank you with every pump of the Blank Spaces pulse. You have taught me much about humility and kindness: from funny, self-deprecating submission emails; to gushing gratitude when accepted; to gracious conceding when edits are requested; to emails expressing thanks for an article that particularly spoke to you. What a privilege it has been to be touched by the happiness Blank Spaces has brought to your journeys. There is a reciprocal synergy to our relationship with contributors and readers. Often, in response to a submission, I will welcome the artist into ‘the tribe’. Because that’s what we are. A tribe. A family. A joint collection of creative souls, seeking to share a little piece of ourselves with the world. The path to publication is riddled with cracks, potholes, even craters. Sometimes it feels like an impossible mountain to climb. Our mission is not to reject, but to smooth the road along the way into our pages. We’re the construction worker in a reflective vest, tapping tar into the holes with the back of a shovel. We are here to fill the gaps. Perhaps it’s your turn to join the family, to become part of the narrative that’s filling the cracks. Stop sitting on your talent—there’s a place for you here! 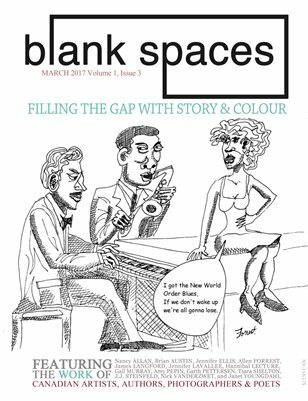 Volume 1, Issue 3 of Blank Spaces is a celebration of Canadian talent, featuring the work of artists—writers, painters, photographers, poets, etc. Thank you for accepting my work and making me a part of this tribe of Canadian artists.